Stone type: Medium-grained, yellowish-white sandstone. 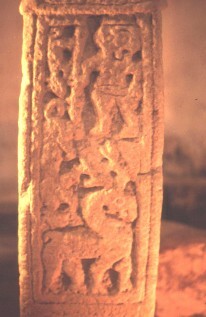 Cross Shaft, front view, dated to tenth century. The lowest part of the shaft is not decorated. There is a single long panel, flanked by a plain, flat edge moulding. This panel contains a hunt scene. A stag stands at the base. At its left, above it, there is a hound. Above this there is a smaller hound. The top right hand quarter of the panel has a standing human figure. He is pointing a spear downwards with his right hand. His left hand is on his knife in its horizontal sheath on his belt. He has a skull cap. His feet point to the left.